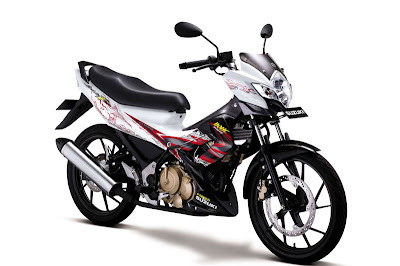 Suzuki Satria F150 2011 with new striping plus Automatic Headlight On or Aho launched PT. Indomobil Suzuki Sales (SIS). Paras super duck is more aggressive and sporty with the new striping is more beautiful and elegant. The changes are increasingly yahud with the addition of Aho - the main light switch on automatically when the engine started. Aho features support for driving safety as stipulated in the law no. 22 of 2009 Article 107. Despite carrying the new style and features the SIS is still membanderol Satria F150 USD 18.565 million (OTR-Jakarta). With a variant of blue-white, gray-black, red and black, white and black. Satria F150 adopts big Suzuki motorcycle technology such as the Suzuki Drive Mode Selector (SDMS), in which users can select three driving modes: Normal for standard mode, ECO mode to drive economic and PWR for aggressive driving mode. Engine technology is claimed to be more advanced than competitors-competitors. Satria F150 engine DOHC, 4-valve, 150cc and fitted water-cooled / SACS (Suzuki Advanced Cooling System) powered 6-speed transmission. With the new striping, Satria F150 is ready to attract back young people in Indonesia.